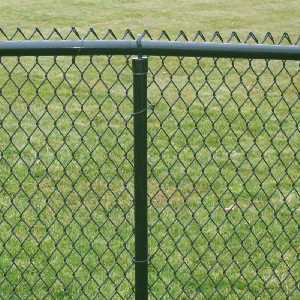 A chain-link fence is sometimes also called wire-mesh fence or a chain-wire fence. It is a woven fence which is usually made from galvanized steel wire. The wires are woven into a zigzag pattern. It has the advantages of being durable and has long life. The chain is strong so it can keep pets contained and keep intruders out. It needs a fresh coat of paint once in a while to give it a shiny look. The installation may take some hard work but it does not require any technical skills. 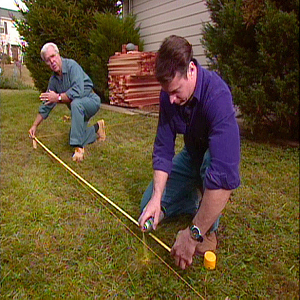 Before you start, check with your local building department regarding the fence height or any construction policies. Mark the location where you want to install the fence. Highlight the points of the corner posts with spray paint. Then mark the placement of the other posts and make sure to keep a uniform distance between them. 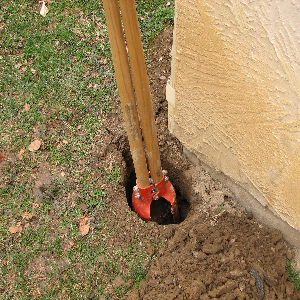 With the help of a post digger, dig holes to an appropriate depth for, usually about 6-inches in diameter and around 3-feet deep. The end posts should be one inch higher than the fence. Mix cement according to directions, its consistency should be of thick mud. Pour the cement in the holes and place the posts in the center. To assure that they are all the same height, use a carpenter's level. Add at least two rail cups to each post and tighten them just a little into place. Then put a dome cap over it. Next, per post slip three tension bands. The bolt should be facing the outside of the fence. Now start stretching the mesh: Begin at one end of the fence and roll out enough mesh to fit on the outside of the fenced area. Continue to make a diamond pattern by twisting the wires. Stop a little before the post and stretch the mesh. If there is excess mesh, cut it out with wire cutters. Secure the ends by attaching the hook to the bolt.